We take advantage of every challenge as an opportunity for women’s empowerment. An example is our approach with stove installation. The smoke in Maasai houses calls out for a stove solution that includes a chimney. This meant we could not use a ready-made stove as a solution. A chimney requires resource-consuming installation. The Project could have hired outside installers. But instead, we saw that the local women could become the installers, in response to recognizing the empowerment opportunity, and this continues to lead to many advantages. For example, in the villages there are now groups of women who understand the stove and are not afraid to dismantle it for maintenance, because they know how to put it back together again. Read about Martha Lobulu–a Maasai woman taking control of her own future. Power at its best is generalizable. It may be developed and expanded in a particular context. But the changes in the people who know and want and have used power can be generalized, increasing power in other arenas of an individual’s life. Our Project continues to prioritize raising men’s awareness of the benefits of the stoves. 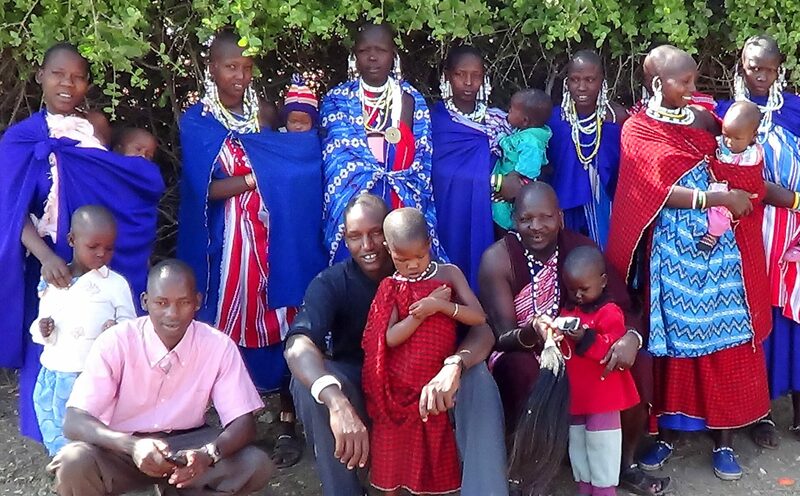 In Maasai culture, the men are in control of most of the family spendable income. Men are often the ones who have to be convinced to purchase the stove, particularly because it is a large purchase for the families. Masiaya has a boma in the Maasai village of Losirwa with seven homes for his seven wives and 23 children. After attending the February village meeting and visiting homes already using the stove, he took action. Masiaya sold one small cow and six goats, purchasing stoves and solar electric systems for all seven of his wives. He told us that our Project is successful and valuable because it addresses his two most important concerns: smoke in the home and excessive women’s labor due to wood-gathering. We ask the men from homes who have the improved stoves to talk to the men who have not yet purchased stoves about the many benefits of adopting the technology. Women’s teams also talk to the men to encourage stove purchases. Masiaya is making sure his friends visit his boma to see that the smoke is gone, and how much more time his wives save with less wood required. He wants to be sure his friends understand why the stoves are such a good investment. We focus on strengthening local economies. Bricks for the stoves are made by local brick-making businesses. These businesses locate clay that is appropriate for fired bricks and build their molding and firing facilities near these deposits, if they can. The steel sheeting is imported by firms in Arusha and sold by local merchants. We purchase it in 4 x 8 sheets and cut, bend, and weld them into fire box pieces in our own factory. Women’s teams in the villages do the installation, laying the bricks for the foundation and chimney. We transport stove parts and materials to villages using our land rover and trailer or our TOYO motorcycle-powered small pickup truck. There is a growing corps of people involved in the project as a long-term, productive activity for the people. We encourage this. Efficiency comes second to the potential sustainability of the changes in people who will be facing challenges all their lives, and need to know how to get the power to do something about them.